Once upon a time in a galaxy far far away... There were thousands of people waiting for the premiere of Star Wars Rebels! And on Friday it finally aired! 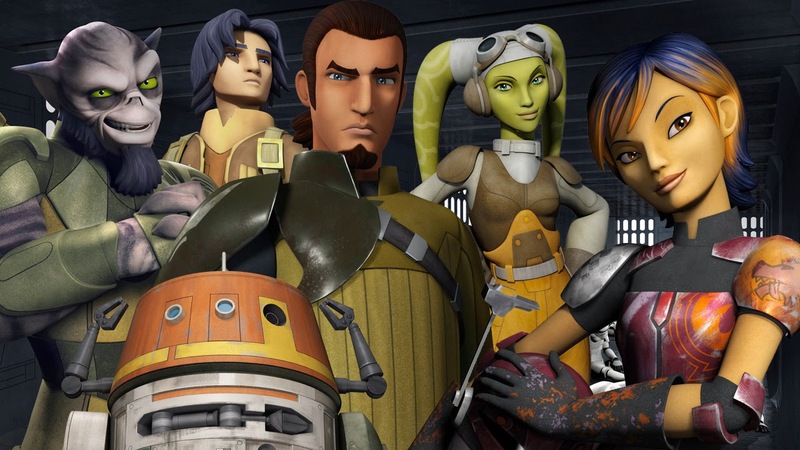 Hera (the green Twi'lek) and Chopper (The droid) are my favorites so far. Hera seems like a really strong character who combines her calm inner strength with an incredible amount of determination and quick wit. I also really like the fact that she's the pilot, which reminds me of Futurama's Leela. As far as Chopper's concerned, I am pretty amazed by the team who created this little fella. I'm a huge R2D2 fan, and I thought it was impossible to create another droid that I could like as much as him. Well, I stand corrected! It's difficult to compare them, obviously, because we haven't seen a lot of Chopper yet, but I'm pretty sure he's got some great things up his sleeve. Well... Not so much sleeve as.. little droid arms. He is just so. Darn. Cute. I really hope he and R2 get to meet each other. I'm really excited to find out how the story continues! Aren't you?